﻿Do you write short stories? Do you wish you could? Do you wish you could complete a short story you began? Do you want expert feedback - not from family or friends (which can be biased) but from an award winning author? In 2004, my short story published in 'The Deccan Herald', and later in a collection of my short stories - 'Dolphin Girl and Other Stories' by Har Anand, Delhi, was broadcast on BBC Radio 4. In 1991, I won second place in the Nehru Children's Book Trust national competition for my science fiction novella for teens- 'Aditya the Underwater Boy'. Having only written short stories before, this was my first attempt at something longer. The book was published by them. 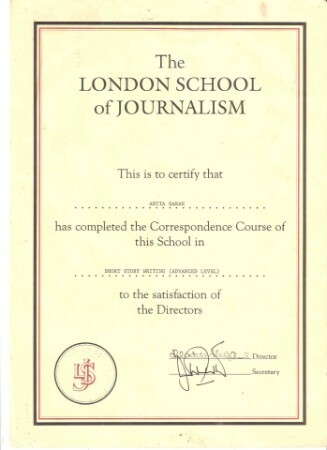 Like you, I too wanted expert feedback on my work despite being published and opting for a Diploma in 'The Advanced Short Story Course' from The London School of Journalism was a wise decision. Since then, many of my stories have been published online such as 'The Enlightened Robot' and 'Panic' published as an audio story by the erstwhile Sniplits. Read the flash 'Sister Mine' at Camroc Press Review.